Walt Disney had been able to accomplish a lot in the live action film business in just one decade, but one of the few genres he had yet to tackle was the live action musical. In 1954, Walt bought the rights to the the cannon of Oz books by L. Frank Baum (except for The Wonderful Wizard of Oz, which was still under contract to MGM). Walt had originally wanted to make an animated version of the books as a follow up to Snow White in the 1940's, but when he sought the rights he discovered that MGM already had them. His new idea was for a film called The Rainbow Road to Oz that would feature various Oz characters and star the Mouseketeers in the lead roles. A teaser episode of Disneyland featured the Mouseketeers performing proposed musical numbers from the film and dressed in the mock-up costumes. However, by 1958 the project was shelved most likely due to the fact that Oz as a film property is hard to touch without drawing comparisons to the MGM film. By 1960, Walt had settled on a different property, Victor Herbert's operetta Babes in Toyland, written in 1903. While most of the Mouseketeers had moved on, Annette Funicello was still active at the studio with a successful music career. She was originally supposed to play Ozma, the lead in Rainbow Road, so it makes sense that she was cast as the lead in this film. Ray Bolger was cast in his first and only Disney role as the villain Barnaby (he played the Scarecrow in the 1939 Oz film). Ed Wynn as the Toymaker was also an interesting choice since he was MGM's original top pic to play the Wizard, but he turned down that role. Teen crooner Tommy Sands was cast opposite Annette in one of his first film roles. More familiar Disney faces flush out the large cast, including Tommy Kirk, Kevin Corcoran and the duo of Henry Calvin and Gene Sheldon who starred in Zorro and Toby Tyler together. The film was shot entirely indoors at the Walt Disney Studio. Jack Donohue was ultimately chosen as the director after several other directors left the project, and this was his first and only film for Disney. Ward Kimball directed all of the animated sequences, including the stop motion toy soldiers march. Ward Kimball also cowrote the screenplay along with Joe Rinaldi and Lowell S. Hawley. While most of the songs were taken from Victor Herbert's operetta, Mel Levin had to provide English lyrics to each of them. Studio songwriters George Bruns and Mel Leven also wrote three additional songs: "The Workshop Song," "The Forest of No Return" and "Slowly He Sank into the Sea" are Disney originals. The film begins with a playbill that opens to reveal the credits while an overture of Victor Herbert's music plays. After the credits, Sylvester the goose pokes his head through blue curtains to introduce Mother Goose, who plays host to this play on screen. As the curtains open, Mother Goose Village is celebrating the wedding of Mary Quite Contrary and Tom Piper, which will take place the next day. However Barnaby, the man in the crooked house, has plans to marry Mary for the money in her dowry. He sends his henchmen to kidnap Tom and Mary's sheep to make her desperate enough to marry him. However, instead of throwing him into the ocean like Barnaby asked, they sold him to some gypsies to double their profit. Mary initially refuses Barnaby's proposal upon hearing the Tom had drowned at sea until her sister, Little Bo Peep, returns home to report that the sheep are missing. As she contemplates accepting Barnaby as her husband, a band of gypsies come into town to put on a show. To everyone's surprise, the gypsy fortune teller is Tom in disguise. After reuniting, Tom and Mary and her siblings run to the Forest of No Return to find the sheep. The talking trees capture them and take them to Toyland, which has been abandoned with the exception of the Toy Maker and his assistant. The group decides to stay and help the Toy Maker assemble toys to meet the Christmas deadline, but Barnaby intervenes. He uses a shrinking ray to shrink Tom, who wages war against the full size crooked man with an army of toy soldiers. After defeating Barnaby and being restored to regular size, Tom and Mary return to Mother Goose Village where they get married and take off in a sled for their honeymoon as the curtains close on the happy scene. 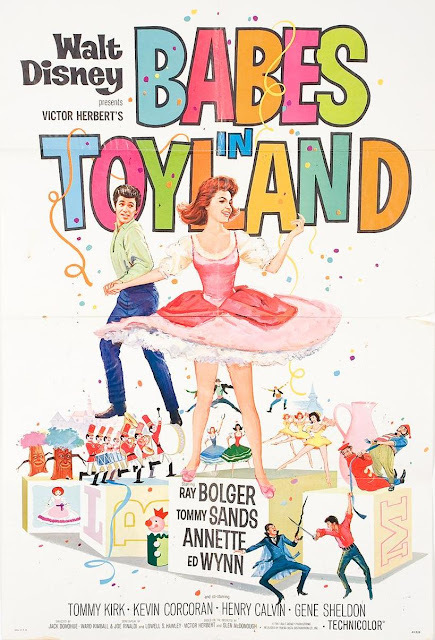 Babes in Toyland was released on December 14th, 1961. Critics were pretty harsh on it, claiming that none of the characters were interesting, the stakes are never high and that anybody who is not a small child will be bored by it. While it had a huge marketing campaign, with a whole episode of The Wonderful World of Color devoted to how it was made, it was not a box office success. It grossed $4.6 million, which would be around $50 million today with inflation, but it reportedly cost more than that to make. It was never rereleased to theaters and made its TV debut in 1969. It was released on VHS in 1982, one of the first home video releases the studio ever did. I first saw Babes in Toyland as a child on TV. I fell in love with it then and I still enjoy it today. However, I think the critics in 1961 may have been right about needing to have seen it as a kid to enjoy it because every adult I've met who first saw this film when they were an adult have disliked it. It's very easy to spot the many faults of the film, namely the fact that all of the characters are one dimensional, but the amazing sets, designed to look like a play, are also fairly one dimensional so it all fits in my eyes. To me, the whole film feels more like a televised version of a Rogers & Hammerstein production than a big budget Disney musical. The special effects in the film are also worth giving it a view. Many of them would appear a few years later in Mary Poppins when Disney attempted another movie musical. After filming, the sets were on display at Disneyland until 1963. The wooden soldiers have become a staple of Disney Parks' Christmas parades. Babes in Toyland is currently available on Blu-Ray. The film is presented in a widescreen aspect ratio of 1.67:1, possibly the open matte ratio (originally presented in 1.75:1). The Blu-Ray release received a substantial restoration, displaying the film with accurate colors and clarity. The film is also available on DVD, where it is sadly presented in pan & scan fullscreen and used the VHS master from the 80's, displaying many flaws in the film that were corrected for the Blu-Ray. Neither of these releases contain any bonus features. It is also available on iTunes in widescreen and in HD.